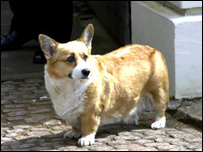 A performance artist says he will eat a corgi live on a London radio show in protest at a hunt led by Prince Philip. Mark McGowan says the meal is a protest at the alleged mistreatment of a fox which was shot during the hunt on the Queen's Sandringham estate in January. "I know some people will find this offensive and tasteless but I am doing this to raise awareness," said McGowan. After a post-mortem was carried out on the fox, the RSPCA said it had found no evidence of unnecessary suffering. A man had been pictured in several newspapers apparently hitting the animal with a flagpole. He told the RSPCA he had simply turned it with his foot to see if it was dead. "An independent post-mortem examination was carried out and found that the fox died from gunshot wounds - and no evidence of other injury or trauma was found," said the RSPCA in a statement. "The only witness who could have supported the version of events reported in some sections of the media refused to give a statement." McGowan, who is a vegetarian, said he wanted his unusual meal to raise awareness about "the RSPCA's inability to prosecute Prince Philip and his friends". The corgi, which died at a breeding farm, will be prepared for consumption on the Bob and Roberta Smith radio programme broadcast on the London-based arts station 104.4 Resonance FM. "We didn't want to make it really distressing visually," said McGowan, "so rather than just have the corgi roasted, they minced the corgi and they've mixed it with herbs and apple and bread and onion. "It's going to be served in a pitta bread with a salad, almost like a kebab on a skewer." 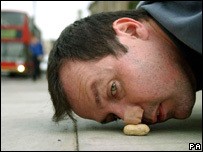 The artist's previous work includes rolling on his side for four miles in central London in December 2002 to ask people to be "nice" at Christmas, and using his nose to push a peanut to Downing Street in protest at student debt. Poorva Joshipura, of the People for the Ethical Treatment of Animals, said: "The idea of eating a corgi will make many people lose their lunch, but certainly foxes who are hunted for so-called entertainment, are no less capable of feeling fear and pain."